The old Louis Armstrong number could have been written for India’s farmers who have been on the road for the past few years – from protests to arrests to police firing and deaths to long marches – for rights and justice. A waiver of the crippling loans that have added to the numbers of farmers' suicides across the country and remunerative prices as per the Swaminathan Committee recommendations are the two demands that the government at the centre has dismissed as a state subject, regardless of the fact that the states do not have the inclination or the resources to alleviate deep agrarian distress. The struggle has coalesced into a joint forum, the All India Kisan Sangharsh Coordination Committee (AIKSCC) bringing at least 200 farmer organisations together. And under this aegis lakhs of farmers will be marching to Delhi from all corners of India, collecting at four different points in and around the city, and then proceeding to the Ramlila grounds on November 29. Here they will be joined by as many farmers joining in directly, and will stay the night, with several artists participating in a cultural programme to do with the agrarian crisis, and the farmers' demands. On November 30, the farmers will march in unity from the Ramlila grounds to the Boat Club lawns. Permission for the same has been sought; if denied the farmers will go instead to Parliament Street. But march we will, the organisers said, and make those in power feel the pressure from the agrarian sector that has been severely discriminated against by the government and policy planners. Farmers, in fact, are emerging as the bulwark of unity, for not just the opposition parties but those who want to preserve the Idea of India based on democracy and secularism. The movement has been linked to democratic values with the farmers standing for unity, regardless of religion and caste. 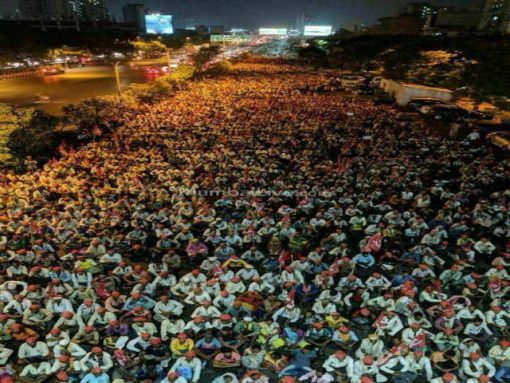 All India Kisan Sabha president Ashok Dhawale told The Citizen that the emphasis would remain on farmers' demands, which they know can be realised only through unity. “They know they have to reject the politics of divisiveness and come together en masse,” Dhawale said. Enthused by the recent convention in Mumbai where opposition leaders including the Nationalist Congress Party’s Sharad Pawar came together on one platform, Dhawale said that political change is crucial for farmers. On November 30, the farmers will be addressed by a host of activists, scholars and others working on agrarian unrest in the first session. The second will see all opposition parties who support the farmers' demands come together, in what will clearly be the first positive glimmerings of unity in the run up to the Lok Sabha polls. In that sense, the unity will be agenda based, with all those participating in the Kisan Mukti March agreeing to make the agrarian crisis central to their agendas and campaigns. Interestingly, as many as 21 opposition parties have already declared their support for two private member bills introduced in the Lok Sabha by farmers' leader Raju Shetty, and in the Rajya Sabha by CPI-M MP KK Ragesh. The first bill is titled Liberation from Death, and the second would mandate remunerative prices at one and a half times the cost of production. And, as Dhawale said, the opposition has agreed to discuss all other issues to do with the “unprecedented” agrarian crisis, asking for a special three-week session of parliament to focus on the farmers in the specific and larger context of their existence. The coordination committee has approached all farmers' organisations, including the Bharatiya Kisan Union which has yet to respond. Recently farmers under the aegis of the BKU from western Uttar Pradesh were stopped at Delhi's borders amidst anger and some violence. Farmers have been very active in organised protest in Rajasthan, Maharashtra, Madhya Pradesh and Tamil Nadu to name just a few states. On August 9, the anniversary of the Quit India movement, over five lakh farmers courted arrest in 410 districts of India demanding justice and rights. The All India Kisan Sabha was at the forefront of this movement. It has been estimated that approximately Rs 15,000 crores are required to waive all farmers' loans.